The most anticipated event of this year – King of the Road participants crossed the finish line! The King of the Road contest lasted for one year and a half and we were glad to be observing this outstanding race with you. Everyone who followed the contest closely witnessed both spectacular gains and crashing losses: for someone the track was more of a bumpy ride, for others even the steepest turn looked like a smooth curve. Enthusiastic traders struggled for one thing – the glory of the title of the King the Road accompanied by the startling prize – Porsche Panamera from OctaFX. This contest proved that success comes to those who trade confidently and persistently, overcoming every possible obstacle, being thoughtful and wise. During last month, we were watching the race holding our breaths – engines roared, positions were shifting with the speed of light, someone lost control taking a steep turn and crashed, but the most confident traders stayed and performed amazingly! We have tested traders’ persistence and confidence and we would like to thank every single participant – you have made it through! We have been waiting for this event for so long: now you can meet the finest traders at the finish line! 1st place – Trader Dedi Kurniawan from Indonesia with 139.5 points – See you soon! 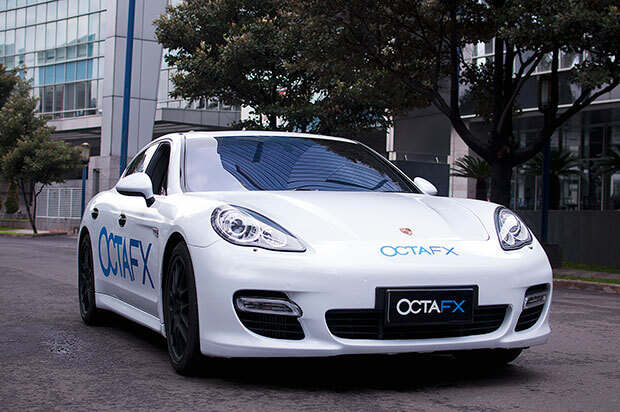 Get ready to become the glorious owner of Porsche Panamera Turbo from OctaFX! We award you the special title of the King of the Road and wish you to master your skills! 2nd place – Trader Royfaizal Bin Razali Chong from Malaysia with 129.1 points – Pack up your suitcases – trip for two to Nice lies ahead! Enjoy yourself in this beautiful place and come back all ready for further victories! 3rd place – Trader Krzysztof Goc from Poland with 116.8 points – Bravo! Soon you will be able to use your brand-new Mac Book Pro to continue your professional trading performance. 4th place – Trader Li Kartono from Indonesia with 100.1 points – an iPad we award you with will allow you to take your trading to the whole new level – everywhere, literary. Stay tuned for further news and interviews from the winners – we bet they have many feelings to share and many useful recommendations for every trader in the growing OctaFX community. The secrets of success to be revealed soon! OctaFX presents November Word it Out Client’s Choice Award winner! A new iPhone goes to the winner of the November Round of Word it Out Review Contest!